Today I’m joining the blog tour for The Pursuit of Ordinary by Nigel Jay Cooper, and I have a Q&A with the author to share with you. Thank you for taking the time to answer my questions. To kick things off, can you tell us a little bit about what your novel is about? After witnessing a fatal car accident, a homeless man wanders the streets, trying to ignore the new, incessant voice inside his head. But he can’t forget the crash, can’t get the face of the woman cradling her dying husband out of his mind. She stared into his eyes, his soul. He has to find her. Is Dan ill or has he really been possessed by the spirit of Natalie’s dead husband, Joe? If he hasn’t, why does she let him into her home so easily? Does she have secrets of her own? Was there anything in particular that inspired the book? When I finished by first novel, Beat The Rain, I decided I wanted to write something completely different and less emotionally challenging. I wrote about 30,000 words of a fantasy novel about body snatchers – people who could migrate their consciousness to other people’s bodies. This got me thinking: what would that feel like? For both the possessed and the possessor? How would other people react, assuming you genuinely believed you were possessed (and the voice in your head genuinely believed they’d possessed you). I ended up dumping the entire fantasy novel and began exploring this idea in a real-world context – a man believing himself to be possessed by another man (and vice versa). 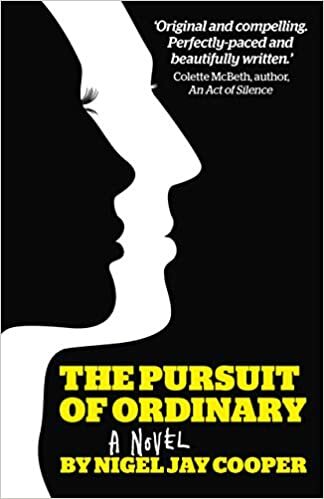 The Pursuit of Ordinary came out of that exploration – their relationship, how they reconciled themselves to the situation with each other and the people who loved them. Did your characters ever surprise you at all when you were writing your novel? Yes, all the time. Often, I’ll get to a planned plot point and a character just won’t do what they’re supposed to and I have to redraft the book around them – which is a weird feeling when you’ve created them. I develop characters quite organically, so I often have no idea how they will react to a situation until I put them in it. Some characters can be quite murky for me when I start to write but small details give them away. For example, in The Pursuit of Ordinary, Natalie has a coffee with her mother-in-law who says ‘I never liked him much’ – and she’s talking about Joe, her dead son. I hadn’t planned on writing that line but once I had, it was quite powerful and told me everything I needed to know about her character. Did you already know what was going to happen before you put pen to paper, or did the plot evolve during the writing process. Unlike my first novel, where I wrote the ending first, I had no idea how this novel was going to end – I only knew the start premise. I knew I wanted to explore the emerging relationship between Dan and Natalie – and how Joe fitted in to that – but the plot was organic. How much research did you have to undertake, before you started writing? A lot. As I was dealing with a homelessness and mental health I wanted to make sure I did these themes justice – both in terms of accuracy and sensitivity. If you had one piece of advice that you could pass on to aspiring writers, what would it be? Write. I honestly believe that’s the only piece of advice of value to writers… everything else is personal preference. Writing is a very personal thing and we all have our own habits, needs and wants. What works for me might not work for you. But all writers actually need to write regularly. And finally, is there anything that you can tell us about what you’re working on next? I wish I wasn’t called Gavin. It doesn’t suit me, doesn’t sum up who I am. It’s a thoughtless name, one chosen before anyone knew who I was or what I might become. I suppose that’s the way with all names. They’re an aspiration, an arrow pointing towards something your parents want you to be, independent of you entirely. Either that or they’re a lazy choice. I imagine my parents chose Gavin because nothing better presented itself and it seemed mildly inoffensive. Gavin: mildly inoffensive. The breadwinner. Dependable. Not memorable, certainly. Just a name attached to a face you bumped into once. A guy, non-descript. The boy next door, except not the one you wanted to shag, the one you didn’t notice because he was beige. Camouflaged, wearing his name like suburban wallpaper. Thank you to Nigel Jay Cooper for answering my questions and to Anne Cater for inviting me to take part in the blog tour. If you would like to purchase a copy of The Pursuit of Ordinary you can do so by clicking the link below.